Mandy Smith is a member of the Missio Alliance writing team, lead pastor of University Christian Church, and co-emcee with Sean Palmer of our Awakenings national gathering. Register now to learn from diverse leaders like her. Livestream options now available if you can’t make it to Alexandria! 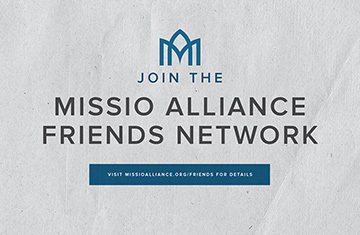 When I first agreed to be a writer for Missio Alliance four years ago, I did so with joy because I love Missio Alliance. But I also had some trepidation—how will I find something to write about every month? And yet every month there has been at least one thing that I have felt pressed to write. But this month my deadline came and went and I had nothing written. If I’m honest, I’m feeling a little disillusioned. Because the things I’ve written (both for Missio Alliance and for other outlets) which have had the smallest readership and response are, in my opinion, about the most significant issues (eg. the true nature of the church, and prophetic ways to overcome despair). And on the other hand, articles I’ve written about identity issues (which feel somewhat important but more ephemeral) get so many more shares and comments. (And it’s heartbreaking to see how quickly the comments on these articles devolve into arguments between false selves, triggering fears and hungers.) How do I steward this reality that posts which name a problem get clicks while posts that proclaim a hopeful way forward get crickets? I feel called to participate in this great social experiment, to be a small voice in this online conversation. At the same time I’m tired of how the internet, by its very nature, shapes the tone and topics of conversation. The false self has to die but we’re all so dang attached to it! Your false self is who you think you are. And your thinking doesn’t make it so. But because you’ve been thinking it so long you tend to get attached to it. What creates this? Well, your culture, your religion, your family, your nationality, your gender, your job, your education, your occupation, your good looks or your bad looks, your intelligence or your non-intelligence. You wrap yourself around all these labels and that’s all they are. Your false self is what’s going to die when you die. ‘So why not die ahead of time?’ is what Jesus is saying. Why get attached to all these things that are going to die anyway? And yet if you look at our politics it’s all we fight about—nationality, ethnicity, gender. Cause that’s all people think they are … So what is the true self? While God has created—and scripture celebrates—nationality, gender, ethnicity, age, gifts, callings, it’s not ALL we are. While it’s important for us to understand these realities about ourselves and one another, it’s not of first importance. When I first became aware of this desperate cycle, I sought out healing prayer. My spiritual director invited me to relive a scene where I’d experienced deep pain and, over an hour of prayer, to invite Jesus into the scene. For most of the hour, the Jesus in the scene just stood there, as all the deepest cuts were made. He let the derision and rejection take place. Finally, as I relived the most painful moment of the experience, the spiritual director asked, “What do you want Jesus to do in this moment?” I made the Jesus in my imagination reach out to draw me into an embrace. But then something I never would have imagined took over—Jesus not only embraced me, He drew me right inside of Himself. I did not dissolve into nothingness but was held in Him. I was hidden in Christ. I’d never felt so known, so understood, so welcomed, so safe, and so brave. I was healed. Jesus himself has taken on the worst of human rejection. The Father allowed him to be belittled and reviled. And through it all, Jesus remained True to his identity in the Father. And when the hatred and hunger had done its worst, the Father received Jesus to Himself. This Truest Self who ever lived was not crushed by all the falseness of humanity. The risen Jesus doesn’t only speak truth, he is Truth, embodied. Because He has become entirely who the Father says He is. The healing experience of being drawn inside Jesus has stayed with me. So, when I’m belittled and dismissed, I ask the Lord to hide me in Him. Jesus absorbs the darts which tempt me to react from my false self. He reminds me of my true self. I ask Him to help me discern what is worth receiving from the human criticism. I ask: “What is from You and what is not from You?” And eventually I’m able to pray for healing from false selves both for me and the one who made me feel small. In some cases, I’m able to speak to the one who made me feel small in a way that speaks to their true self. As Paul promises in Colossians 3, since we have died to our false selves, our lives are now hidden in Christ’s True Self—the Truest Self that has ever lived—so we are able to set our hearts and minds on things above, not on earthly things. It not only changes how we see ourselves, it changes how we see others, how we react to them. It breaks false cycles and releases us from our fragility, victimhood, and triggers. How, as Christians, are we talking about identity politics (which are important conversations) in a way that engages our false selves? Even in our efforts to find healing for all the broken ways the world marginalizes, misunderstands, and divides us, how are we sacralizing our autonomous selves, keeping ourselves and each other in an endless loop of individualism, fragile victimhood, and brokenness? Even if those patterns of how the world treats us can never be entirely redeemed, isn’t it possible that we can be redeemed? My hope lies in the fact that while I may never discover a place among broken humans where I am entirely welcomed or understood, I am finding that place in the Lord. And the more I find it, the more I am able to break my habit of speaking to others from my broken, lonely self. The more I am able to speak over others not only how God sees me but how God sees them. This realization makes me want to write again. This experience has helped me name that my motivation for writing about identity is not to perpetuate the world’s way of defining our identity but so that we can discern our true selves. What if all the things that trigger us are actually triggering our false selves? What if every fragility is a sign of a fragile false self? What if God doesn’t want to protect us from fragility and triggers but restore our true selves? What if He wants us to know that even if we’ve been misunderstood and marginalized, He sees us first and foremost as His beloved? In all the conversations which we’re engaging in person and online, what does it mean to enter with the hope of discerning our true selves? How are we tempted to stay on the level of the false self and avoid the transformative work of the Spirit? How might these identity conversations be an opportunity for healing, so that we are no longer primarily defined by anything beyond our identity in Him? May we see Him as He is. May we see ourselves as He sees us. May we see others as they truly are. So that Church herself may remember her True Self.